A peer-reviewed study published in Issues in Law and Medicine confirms that the abortion pill reversal protocol can, when administered promptly, block the effects of a chemical abortion and allow children to grow to term. A little background. "The abortion pill" is a misnomer. Chemical abortions actually consist of two medications. The first, mifepristone, blocks the crucial pregnancy hormone progesterone. Without adequate progesterone, the endometrium breaks down and the embryo's nutrient supply is destroyed, which causes the embryo to detach and die. The second, misoprostol, expels the embryo's body. The abortion pill reversal protocol is used when a woman takes the first pill, then changes her mind. The reversal technique involves the administration of extra, synthetic progesterone to supplement the woman's natural progesterone and overwhelm the anti-progesterone effect of the mifepristone. Therefore, the results of the Issues in Law and Medicine study do not come as a surprise for anyone who's been paying close attention. However, there are two aspects of it that deserve special notice. First, it should forever put to rest the pro-abortion argument that mifepristone is usually ineffective on its own (with the second pill, misoprostol, apparently doing the real work), so the reversal protocol amounts to a placebo. I've always found "we're selling women a pill that doesn't actually do anything" to be a questionable defense, but setting aside the ethics of it, it's factually wrong. Previous studies found that without any intervention—that is, if a woman changes her mind and doesn't take the second pill, but doesn't seek any help for the first pill she's already taken—the embryo only survives 25% of the time. But with the abortion pill reversal intervention, administered less than 72 hours after the mifepristone was taken, survival rates are nearly twice that at 48%. The abortion pill reversal protocol is significantly more effective when given orally at a high dose (68%) or intramuscularly (64-100% depending on dosage); vaginal administration of progesterone was considerably less effective, bringing down the overall average, and I expect it will not be used going forward based on this study. The age of the embryo also made a difference, with older embryos being much more likely to survive than younger ones. Second, the study found no evidence that the abortion pill reversal protocol creates any risk to the child. The birth defects rate for children born after an abortion pill reversal was no different than the general population. They were also far less likely to be born prematurely, perhaps a side effect of more careful medical monitoring than the average mother receives in pregnancy. Regardless of whether abortion-pill reversal works, it’s important to note that the percentage of women who regret a medication abortion halfway through is decidedly tiny. [The abortion pill reversal] hotline received 1,668 calls between June 2012 and June 2016 ... Meanwhile, medication abortions now make up almost half of all abortions in the United States, according to a Reuters analysis in 2016. According to the Centers for Disease Control and Prevention’s latest count, 123,254 women underwent the procedure in 43 states in 2014—a very conservative estimate, since large states including California and Illinois didn’t report their numbers ... Even going with these incomplete numbers, the number of women who regret their medication abortion halfway through clocks in at just 0.3 percent, with fewer than half asking for the reversal. She also writes that "the goal when administering the abortion pill should be to make sure patients feel fully confident in the decision, rather than telling them they can always undo it later if they change their mind." Dave Andrusko of the National Right to Life Committee pilloried this quote in particular, saying: "You have to keep the abortion train rolling. Don't tell a woman she could have a second chance. She might take it!" His interpretation is valid, but interestingly, I've heard sidewalk counselors express a similar sentiment: that they don't talk about abortion pill reversal (or other post-abortion resources) on a woman's way into an abortion facility, but only as she is leaving. The ideal outcome is for a woman not to take the mifepristone at all, and suggesting that she "can always undo it" might make her more cavalier about the decision. I am thankful for the abortion pill reversal protocol and applaud the pro-life medical professionals who have developed and promoted it. But as effective as it is, it does not save the child's life 100% of the time. It is only one tool in our toolbox. 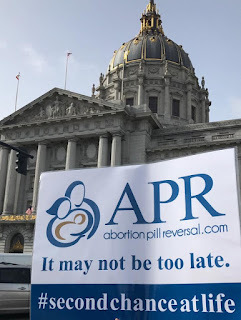 If you are pregnant and have taken the first pill of the chemical abortion regimen, call the Abortion Pill Reversal hotline right away at 877-558-0333. *Graham's article refers to ten states which have introduced such laws, but according to the pro-abortion Guttmacher Institute, only four have actually implemented them: Arizona, Arkansas, South Dakota, and Utah. Those states had a combined total of 20,880 abortions in 2014 (AZ 12,780/1.2%; AK 4,590/0.5%; SD 550/0.1%; UT 2,960/0.3%). 2014 is the most recent year for which complete Guttmacher data is available. Note that many of those 20,880 abortions were presumably surgical, not chemical, making the reversal protocol inapplicable; unfortunately, I could not find that data at the state level.